Welcome to JJ & Sons Party Rentals. 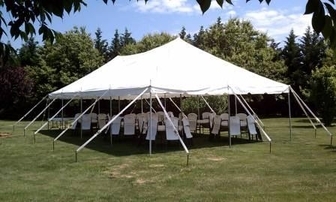 We have the tables, chairs, and tents you need to make your event a success. Whether it's a wedding, graduation party, or a family dinner for the holidays, we have what you need. The tables and chairs are quality Lifetime brand and white in color. The chairs have rounded backs to provide you and your guests comfort. We have tents ranging from 10x10 to 60x40. Tent packages are also available. We are proud to serve the following areas in Delaware: Hockessin, Wilmington, Newark, Bear, Christiana, New Castle, Delaware City, Port Penn, Middletown, Odessa, Townsend, Smyrna, Clayton, Dover, Camden, Frederica, Leipsic, Little Creek, Kenton, Felton, Milford. We also serve the following areas in Maryland: Cecilton, Elkton, Earleville, Millington, Galena, Chestertown, Betterton, Sudlersville. Simply click on the Contact Us page and submit your request for a free estimate.